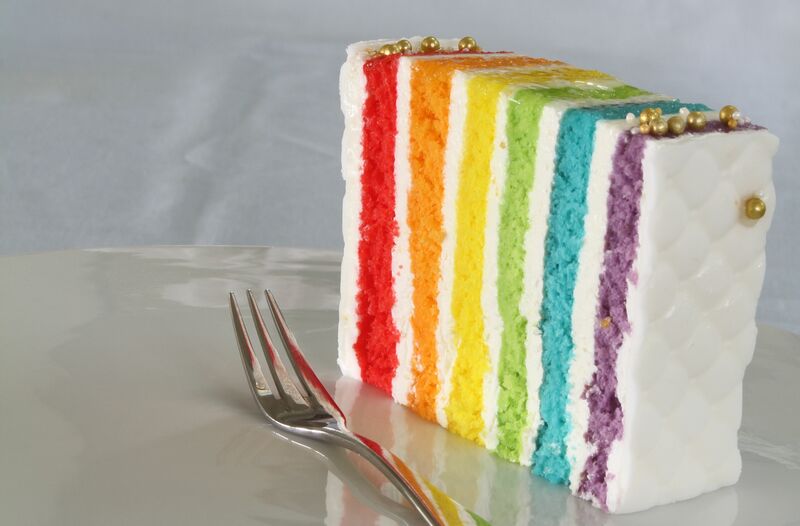 Rainbow Cake itself is enough to create colorfulness but why not add more fun twist to regular layer cakes with Vertical Rainbow Cake. Just flip the cake on its side and you’ll have something different on your dining table. Line three 23x33cm (9x13”) rectangular baking trays with greaseproof paper or sili-cone sheet. Preheat oven to 180°C. Sift flour, cornflour and ground almond together. Beat the eggs and sugar together until thick, pale, and fluffy. Fold in sifted dry ingredients and then add warm melted butter and mix thoroughly but lightly. Divide the mixture into three portions. Colour one red, one orange, and the last, yellow. Pour each coloured mixture into a sepa-rate baking tray, smoothen with spatula, and bake for 8 minutes. Unmould and cover with cling film. Repeat the above process to make a second batch of batter, and colour the mixture green, blue and purple. Boil sugar and water until sugar dissolves. Cool and add the orange juice. Whip cream together with the orange zest until soft peaks form. Using a pastry brush, apply the orange syrup on each layer of sponge. Then spread 160g of whipped cream on each sponge layer and stack them up. Freeze for 4 hours. Cut the cake into three 23x11cm (9x4”) rectangles, and give them a 90° turn so that the lines are vertical. Decorate as desired.